The ever so brilliant English tv show Yes Minister and Yes Prime Minister had an episode where the biggest threat to a politician's career was to appointed Minister for Northern Ireland. 'Please Prime Minister, not Minister for Northern Ireland. Give me the Ministry for Health or Transport, but not Northern Ireland'. It was something like that. I wonder if diplomats in Israel are feeling a bit like being appointed Minister for Northern Ireland. The American embassy in Israel is in the very civilised, open and embracing seaside city of Tel Aviv. For some reason beyond my understanding, Trumpet wants the American embassy to relocate to Jerusalem. It seems like he may have his way. Are American diplomats in Israel pleading, 'Please Mr President, not Jerusalem. Anywhere but there'. From my understanding, I should think so. Trump has long championed the causes of those on the hard-right of Israeli politics. Not least because they have supported him. Take Las Vegas casino tycoon Sheldon Adelson - a passionate supporter of radical Jewish settler groups in Jerusalem. Someone named Tess made a comment on an old post and provided a link to a short clip from the 1959 movie, On the Beach, starring Ava Gardner and Gregory Peck. It was set in Australia and most of the filming took place in Melbourne and the very outer suburbs of Frankston and Berwick, and on Phillip Island. I haven't seen the film and I was delighted to watch the short clip Tess referred me to. Gardner and Peck stroll down Swanston Street, and getting in the way of everyone. There is Mother's favourite place to dine in the city, the Classic Restaurant, which I thought was Classic Cafe. She took we children there many times after shopping for afternoon tea before catching a train home. Ava dashes across Flinders Street to the station, which hasn't changed a huge deal on the outside. Its new paint job is currently being slowly revealed. The ever so modern blue Harris train (filled with asbestos) is in the station but I did not think the sound of the whistle (horn?) was correct and after some hunting online, it was not the sound such a train used to make. Some people may remember the other shops seen in Swanston Street, but given it was 1959, maybe not many. The clip is 2:32. On the Beach was a nuclear fallout movie, quite challenging for its time. I think the world was dying from nuclear fallout. Ava was quoted as saying Melbourne was a good city to make a film about the end of the world, but that is quite untrue. I remember Neil Jillett as a columnist at The Age and an arts reviewer. Wikipedia tells me he submitted the quote in inverted commas and a sub editor dropped the inverted commas. Of course Sydneysiders do like to perpetuate the lie that it was a direct quote from Ava. Twice in England we visited the cheap store Primark, and I noticed something. The clothing seemed to be of a similar price to what we pay in Australia, but it was of higher quality. The fabrics were thicker, the sewing better, the buttons more firmly attached. I was quite impressed by Primark, perhaps equivalent to our Big W or Target. Primark's clothes seemed to mostly come from Bangladesh, whereas most of ours comes from China. Australia's cheap clothing seems more like what is available in the US, except it is even cheaper in the US. I bought a shirt in Macy's department store in New York. It was a nice shirt but the fabric was so thin and already the buttons were loose. By the time the discounted shirt received a coupon discount as well, not that we had a coupon, and the discount that staff could give, I was almost paid to take the shirt. I rather liked Macys. Department store clothing retail is difficult in Australia. The UK origin Topshop Australia is in receivership. I think world wide Oroton has ceased trading. Ladies, save your Glomesh purses. They may be worth something one day. UK Spanish owned Zara is surviving, as is the Swedish giant H&M. And we have a new entrant in Melbourne, one remembered well by R when he was but a lad, Debenhams. We called in for a look see, and we were so impressed with the clothing we saw. It was like nothing we had seen in Melbourne before, and not terribly expensive. I saw a shirt I really wanted (several actually), but we were going to see a movie and I did not want to have to carry the shirt, so I did not buy it, and I am trying to resist going back there again. Single father parenting is not something I have given any thought to. Probably all of you know someone who is a single mother, be it by separation, death, illness, choice.....there are many reasons why someone may be a single parent. Single mothers do seem to have a voice in public. Single fathers, not really. I received an email from a single father, who I assume is in the US but may not be, who has set up a website with information for single fathers. It is not really relevant where Daniel is, as I expect the issues single fathers may face are the same the western world over. He asked if I could give his website some publicity, and while I am not sure I am the right person for that, after having a look at his website, I am happy to lend some support. His website is here http://dadsolo.com/ This is his website introduction. Daniel submitted this piece to me for you to have a read and who knows what Google will pick up and people will find. I can certainly agree with his point about being organised. Children thrive on organisation (and boundaries). I expect Daniel would really appreciate your comments. Life as a single father is challenging but rewarding. It’s not easy going it alone. You’re responsible for the cooking, cleaning, discipline and everything else that goes along with being a parent. At times, it can be overwhelming, especially if you’re not accustomed to being a single dad. 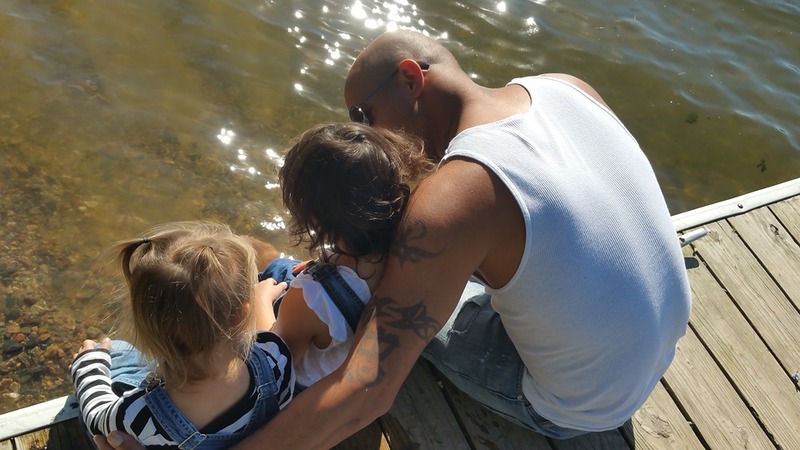 There are many reasons you may end up facing single fatherhood. Divorce, death, partner abandonment or other personal circumstances may occur unexpectedly. If you’re raising children on your own, read these tips to help you meet any challenges thrown your way. Parenting is tough, even if you have a partner to help you with the daily responsibilities. But when you don’t have a partner to assist you, parenting is even tougher. Find a support network of family and friends to provide advice. Family members and close friends can help you perfect your cooking skills or teach you how to do your three-year-old daughter’s hair. Your support network can help you with babysitting too. If you don’t have family members to help out, find a support group of other single dads. You can learn from other fathers who are in the same boat and who can provide practical advice. As a single parent, it’s important that you get organized. Since you’re the only parent in the home, you should find efficient ways to take care of home chores, the laundry, grocery shopping, getting the kids off to school and a million other things a single parent has to do. Being as organized as possible will help you juggle all of your varied responsibilities in the best way possible. Work and life balance is key to raising a successful, happy family. Your kids need to spend time with you, even if it’s just going to the park to play baseball. When you’re the only adult living at home, you need to sit down with your boss and have an honest discussion about your situation. If possible, ask to have more flexible hours or the ability to do some of your work from home. Some businesses are open to their employees telecommuting from home or working flexible hours as long as the work gets done. And when it’s time to ask for vacation time, try to schedule it during the same time as your kids’ school vacations. Single fatherhood isn’t always planned. And if it happens to you, it can be a scary experience. After all, even two parents living in the same home find parenting to be a challenge. But if you use some of these tips, you’ll find that being a single dad is an exciting, rewarding experience where you watch your children gradually blossom into responsible, successful adults. The lighting was rather good; the trees with four lights with a generator. At times some light generators did not start up at dusk and many of the 'light bulbs' failed. New LED street lighting was installed. This is exciting, the first tram through. The first tram on the new Toorak route 58 track. Trams everywhere very early this morning. I think you will have to click on this photo to see detail, but it pretty much how things ended up. I have delayed posting these many photos until down below is complete, but it is still not. The good is less walking for us to the inbound tram stop, but we have lost out bus stop down below, and lost so much on street parking. I would guess the loss of something like 60 spaces. It makes it hard for any visitors to The Highrise, but then no one really comes here anyway now. Life has changed and moved on. I have recovered from by brief hangover illness. Thank you all for your good wishes. I have posted two photos here of the robot. I cannot get any closer and I am not prepared to learn the skills of removing tramway overhead wires from photos. Immediately upon publishing, I will delete one photo and leave the one that shows the best detail. Interestingly I added light to one of the ten photos I took of the robot on this overcast day, but the photo lost detail. The first photo I took with the camera on auto is the best. I hope you can see the original here. Yep, that works well. Mr Andrew Highriser is unwell today. No Andrew, we are not going to visit Ballarat this week. We are tired after the wedding. I shut my my mouth. R forfeited his free public transport pensioner public transport days last year, but hey, why can't we go to Ballarat, so why can't we go and use the free tickets? It will cost us nothing for the fare.We will just go for lunch. R came good and at the very end of my time off work, he said we will go to Ballarat for lunch. We caught the 58 tram into town and walked down the hill to Southern Cross Station. It took a little time to get the free tickets organised. We were on the train only a couple of minutes before it was due to depart, the best seats already taken, but we did find two forward facing seats with opposing facing seats near the noisy air con intake on a VLocity train. I love hearing the motors rev to generate power to move the train. Once clear of the suburbs, the train moved at a spanking pace, reaching its 160 km/h maximum speed at times. I mostly gazed out at the passing scenery, while R mostly gazed at his phone. Caroline Springs suburb has been in existence for many years, perhaps over two decades or more, but only this year did a train station open there to service the suburb. But the station is in the middle of nowhere. Not a house to be seen from the train. Don't give up your car too soon. I didn't get a photo but we passed by a large body of water. Is it a lake? Is it wide river? It was both, Melton Reservoir fed by Werribee River. There is a village in the distance. Right, Bacchus Marsh. Not exactly a village but a decent sized town. The journey took about one hour and twenty minutes. I had heard Ballarat Station was impressive. It is. These are former railway goods sheds. They are constructed with local bluestone which litters the landscape in this western part of Victoria. It is a very hard lava rock and is used in many places in Melbourne, from buildings, to edging, to kerb and channels, to laneway paving. I believe the sheds are being converted into a convention centre after sitting empty for decades. Wow, there are just so many historic and preserved buildings in Ballarat. Ballarat was founded on wealth from gold mining and was the site of the Eureka Stockade or rebellion, where miners bravely but unsuccessfully stood up to authorities over the cost of mining licenses and other matter. It is suggested the rebellion led to the birth of democracy in Australia. So, Ballarat is very important in Australia's history. A strange display in Police Lane. The George Hotel, built in 1902, there being two former George Hotels. Click on this link to see the brilliant view from the hotel verandah. Pity about the plastic but the weather was still cool then. I once had two pen and ink drawings, one of The George Hotel, the other of Craigs Hotel, coming later. Commercial buildings. On the side we were walking, it was just cafe after cafe, all of them seemingly very quiet on what should have been, I would have thought, a busy Friday lunch time. They would not be at all viable if they were paying Melbourne levels rents. We passed all the buildings above in a walk along Lydiard Street North of about 200 metres from the station. Across the main street, Sturt Street, the third building along with the tower is Craigs Hotel. It was built in 1865 and is a rather upmarket hotel but it has had patchy times in the past. The centre of the wide Sturt Street is public gardens and what would a country town in Victoria be without a statue of her good self with the grumpy visage. The Myer department store is within this building. The windows had a Christmas display, which was part of last year's Melbourne store's display. We found a bakery and had a pleasant lunch. I think I had a beef pie. We crossed Sturt Street, past the concrete George V.
Parts of Ballarat can be a bit rough, but there were a number of rainbow flags being flown, this one at the town hall. I think we were there just after the vote count for marriage equality. Well spotted R. I had forgotten about the old spelling of Ballaarat. Note the extra a. The name Ballaarat came from two Aboriginal words, balla and arat, hence the two aa letters together. Both spellings were used, resulting in much confusion. I believe the current Ballarat spelling became pretty well formalised about 1920. Her Majesty's Theatre opened in 1875 and has since then be continually in use for performing arts. The rotunda in the central gardens of Sturt Street. Nice block of flats. Nice rainbow flag. Ugly placement of air conditioning unit. The roof of the building behind intrigues me. Erected by the Ballarat Historical Society in 1951 to commemorate the centenary of the discovery of gold. There is a little art deco in Ballarat. Entrance to the Mechanics Institute. Almost every town in Australia had a Mechanics Institute, where the working classes could obtain an adult education out of working hours. They went on to become rather a lot more than just a place for education and enveloped the community. A statue of Scottish poet Robbie Burns. One wonders why. We called in to the small gallery at the old Post Office, now being a space for Federation University. There were small sculptures of humans in various states of dismemberment and decay. It was revolting. We quickly left. We had about 15 minutes before our train to have a look at a proper gallery with pretty pictures and wish we had an hour or more to spare. The gallery was brilliant, with many famous Australian paintings and artists who I knew of but not their work on display here. We have seen the excellent regional Bendigo and Geelong galleries and this one sits well with them. Ballarat Art Gallery is the largest and oldest regional gallery in Australia, having opened in 1890. Old style railway gates in Lydiard Street North. Our train was coming from the Ararat terminus. I like that the old disused semaphore railway signals have been retained. We stood on the platform waiting for the train and the gates half closed, opened, fully closed, opened, half closed and this went on for a few minutes, much to the frustration of car drivers. I don't know if the malfunctioning gates delayed our train, because it did arrive a few minutes late. We scrambled aboard quickly and found two forward facing seats on the train that was already quite busy. Rather extraordinary really. We were city bound on a Friday afternoon, with no significant events on in Melbourne and by Melton Station people were having to stand. A very odd looking house, somewhere along the way. While I love very high speed train travel at 300 plus km/h, it is a bit hard to see the views. At 160 km/h, you can see much better. Another religious building which at least I know is a Buddhist temple. I, and I expect many others, have never seen the front of this statue of Buddha. Our train arrived at Southern Cross Station on time at the station and we caught a suburban train to Flinders Street and the tram home. Ballarat Station to our front door in less than 1 hour 40 minutes. Not bad. Next year the Ballarat line will undergo significant upgrades.